Jo Majithia Eat4Wellbeing Recipe. Banana and Walnut Bread. Healthy Breakfast. Gluten-free. Jo Majithia Eat4Wellbeing Recipe - Gooey Date and Hazelnut Brownies. Gluten-free, Vegan, Vegetarian, Desserts, Sweet treats . Jo Majithia Eat4Wellbeing Recipe - Lunchbox Winter Salad. Healthy Side Vegetables, Hormone Balancing, Light Lunch, Salads, One pot meals, Vegetarian, Vegan, Winter Recipes . Jo Majithia Eat4Wellbeing Recipe -Red Lentil and Squash Soup with Rosemary. Autumn Recipes, Lentils, Soup, Vegan, Vegetarian, What to cook on Halloween, What to do with Pumpkins, What to do with Squash . Jo Majithia Eat4Wellbeing Recipe - Black Beans with Roasted Squash, Toasted Kale and Sage. Jo Majithia Eat4Wellbeing Recipe - Nutty Granola Bars. Healthy Snacks, Healthy Breakfast . These bars are full of healthy fats from the nuts and seeds and the bars provide a good source of fibre, B vitamins, vitamin E and minerals such as magnesium, manganese, zinc and copper . 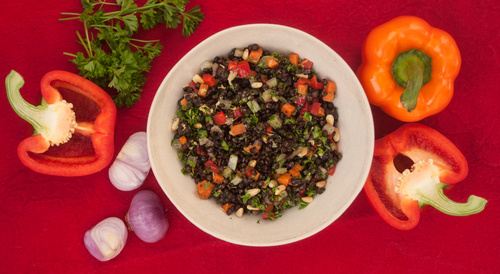 Jo Majithia Eat4Wellbeing Recipe - Puy Lentil and Tomato Salad. Summer Recipes, Salads, Light Lunch, Healthy Recipes . Lentils originate from Asia and North Africa and do not require pre-soaking before cooking, unlike other pulses.